Rough Red Rash on the Face? A good number of patients present reporting a red, dry rash on the face, often affecting the sides of the nose and eyebrow area. Often, this is caused by a rash called seborrheic dermatitis. While many people may think of seborrheic dermatitis as a scalp condition, it can affect both the scalp, face, and other skin surfaces. Sometimes, this condition is also referred to as seborrheic eczema. When affecting the scalp, it may be referred to as “dandruff” when mild, or as cradle cap in babies. Seborrheic dermatitis is an inflammatory condition. Inflammation in the skin is caused by the presence of certain cells which then leads to rashes such as seborrheic dermatitis. Often, this inflammation is marked by accompanying redness. Some of this inflammation can make the scalp feel itchy as well. 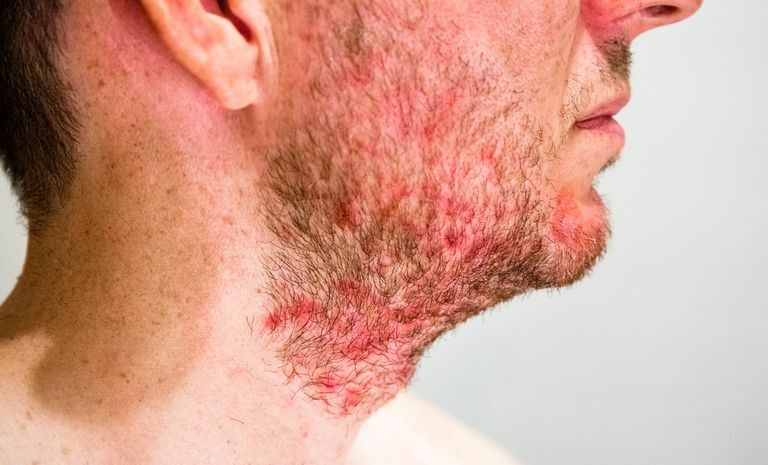 Seborrheic dermatitis itself is not a life-threatening condition in general, although in rare cases, it can be widespread and affect the majority of the skin surface, leading to complications found in erythroderma. These cases are rare and more common in certain populations such as those infected with the human immunodeficiency virus. While the exact cause is not known, involvement of the Malessezia yeast has been implicated based on observation that treatment with an anti-yeast agent such as ketoconazole may improve the condition. This is also based on the observation that this condition tends to affect areas with high sebum content which can help promote the yeast growth. We do know that inflammation is present in this condition and some people postulate that the inflammation is in reaction to the yeast. How Does Seborrheic Dermatitis Present? There is a whole range of presentations of seborrheic dermatitis. Here, we discuss involvement of the face. However, this rash can actually affect many other areas, especially those high in sebaceous glands. The scalp is another commonly affected area. The chest and groin can also be affected. When seborrheic dermatitis affects the face, it often affects the area between the eyebrows, over the eyebrows, on the sides of the nose including the folds on the side of the nose. It often affects the hairline as well, often extending into the scalp. When seborrheic dermatitis appear on the face, there may be variable amounts of flaking skin, redness and itch. When mild, the skin may appear just slightly pink with very small amounts of flaking. When severe, there can be more intense redness and flaking. The amount of itch, irritation, or burning can vary as well. How Can Seborrheic Dermatitis Be Treated? Many people think that peeling off the flaking skin will help the rash. However, this does not help treat the rash and can actually irritate the rash even more. People with seborrheic dermatitis often opt for treatment for cosmetic or symptomatic reasons. Treatment is often topical and may consist of over the counter or prescription lotions, solutions, soaps or washes. Over the counter anti-dandruff shampoo is sometimes used as a face wash including those containing selenium, salicylic acid, tar, zinc or ketoconazole may be helpful. Stronger ketoconazole preparations in wash or cream form as well as topical steroid lotions or solutions are available by prescription. Your healthcare provider can tell you how to use these prescription medications. How Do You Get Prescription Medications for Seborrheic Dermatitis? In many cases, your primary care provider can provide these medications. In more severe or stubborn cases, you may want to see a dermatologist. What Is the Prognosis for Seborrheic Dermatitis? Seborrheic dermatitis is often considered a chronic condition where it is not cured, but rather, is controlled through the above treatments if desired. The condition may get better and worse on its own at different times as well.